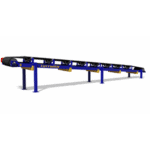 Tuffman® horizontal slider bed conveyors are great for moving materials around your facility. Options such as variable speed conveyor drives, belt cleaners, and other accessories are also available. Choose an option 12" 24" 30" 32" 36" 42" 48"
Choose an option 30" 36" 42" 48"
E-stop button on control and e-stop input for additional safety circuits. 2 ply smooth rubber belt. 3 phase 460 volt drive. Fixed or variable speed controller. Pull cord E-stop on one or both sides.